Along with our products shown on this site, we do wedding favors, gift baskets and other specialities. Feel free to contact us for any inquiries. With our gift baskets, you can create a custom package for any occassion. Some items to consider for the gift baskets include: all bottle sizes of maple syrup, any combination of maple glazed nuts, maple tea (herbal and caffeine-free), homemade pancake mixes, etc. You can create a themed gift basket as well. For example, Mountaineer fans will surely enjoy a pint of pure maple syrup that is decorated in blue and gold! My name is Sam, and I, along with my husband Ricky, make delicious maple syrup on our farm. The farm, Ricky's family farm, has been used for crops, cattle and tree tapping over the years. In the early 1900's, the trees were tapped as the main source of sugar for the family. However, cattle seemed to be more fortuitous , and the trees sat dormant for many years. In November 2013 we broke ground on our sugar shack, barely getting it finished in time for the start of maple season in February. We had no idea what we were getting into, but with a lot of help from other producers, we survived our first season! Alongside the maple, both Ricky and I our high school science teachers. I took a leave of absence when our twins girls were born prematurely, requiring an extended NICU stay. We look forward to raising these little "sap suckers" to love maple. We strive to provide the best maple experience possible. 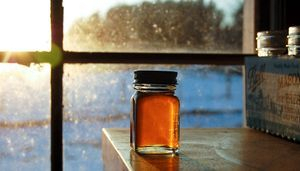 We pride ourselves on offering organic maple syrup, nature's greatest sweetener.